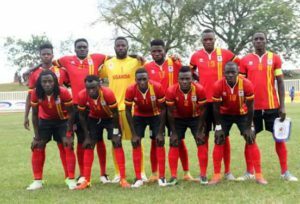 The Uganda Cranes team that started yesterday against Burundi. Courtesy photo. FOOTBALL–After the Uganda Cranes were left frustrated by Burundi in their opening game at the CECAFA Senior Challenge Cup as the two countries played out the second goaless draw of the 2017 tournament, head coach Moses Basena has come out and said he is not worried about the luck of goals by his side. “We can not go back and mourn a the goaless draw. It was clear we dominated from the start to finish but we need to work on our finishing in the next games.They (Burundi) defended resiliantly and we failed to penetrate them on many occasions,” Moses Basena said after the game. “I am not going to blame my players because their input was ok but like i said, we only need to work on our finishing,” he added. The Uganda Cranes yesterday created limited chances and were left to take speculative efforts which did not help their cause. Dispute starting with several offensive minded players, the cranes almost created nothing from open play in the first half. It was untill the final quater I the game when they started looking like they could score but it was alittle to late as the goal eluded them untill the final whistle. The Cranes started with KCCA FC forward Derrick Nsibambi upfront with Milton Karisa, Muzamir Mutyaba, Allan Katerega and Allan Kyambadde all in support of the KCCA forward. With league top scorers Hood Kawesa and Nelson Ssenkatuka coming on in the second half coupled by Uganda’s recent struggles infront of goal evident in the fact that the Cranes scored only two goals in the world cup qualification campaign, something needs to be sorted out as soon as possible for the goals to start flying in. Uganda is currently second in group B and play their next game tomorrow. Team that started against Burundi.